Documents & Media staff were recognized for their dedicated years of service to the University at the CLS Milestone Service Awards luncheon on Thursday, May 26th at the Millberry Union Conference Center. Organized by the CLS Campus Life Team this annual milestone event helps build loyalty and pride of Campus Life Services as an organization, through enrichment and support of the employee’s work/life environment. DM staff who received their awards were joined by DM supervisors Pam Krol and Steven Westwood. 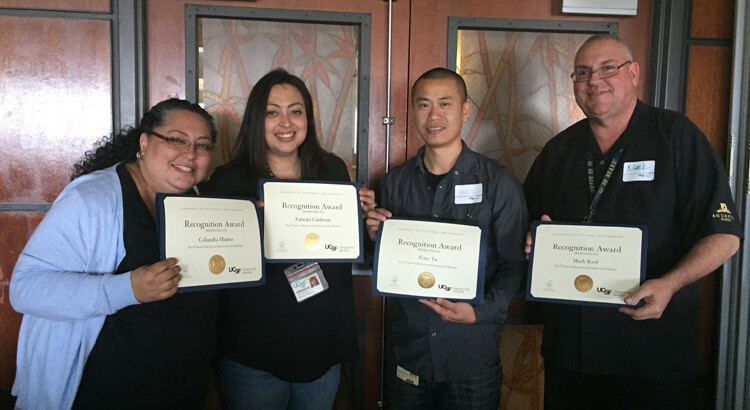 In attendance were Fabiola Calderon, Mark Krol, and Columba Muñoz from our team located at UC Berkeley in the Moffitt Library Copy Center, who were each recognized for 5 years of service. Also in attendance was Eric Wu from our team overseeing the UCSF Print Management Program, who was recognized for 15 years of service. Unable to attend but not forgotten, was Peter Yu from our team located at UC Hastings College of the Law in the Hastings Business Center, who was recognized for 10 years of service. Congratulations to all for their loyalty and dedication to the University!